The 9kg ABC dry powder extinguisher is a multi purpose extinguisher suitable for use on (Class A, B and C) fires involving combustible solids, flammable liquids and gases. Whilst it is safe for use on electrical fires, it should be noted that it can cause corrosion. Ideal for domestic use and and a variety of commercial and industrial applications. A fire extinguisher is an active fire protection device used to extinguish or control small fires, often in emergency situations. It is not intended for use on an out-of-control fire, such as one which has reached the ceiling, endangers the user or otherwise requires the expertise of a fire fighter. Choosing the right fire extinguisher. It is very essential that the right type of extinguisher is used for the fire. Choosing the wrong type of extinguisher can have life-threatening consequences.Fire extinguishers come in a wide variety of types — each one designed to put out a different kind of fire. ABC Fire Extinguishers use mono-ammonium phosphate which is a dry chemical that is able to quickly put out all three classes of fire, Class A, Class B and Class C, meaning they’re suitable for putting out wood and paper fires, flammable liquid fires, and electrical fires. ABC extinguishers use the dry chemical mono-ammonium phosphate as the extinguishing agent. The fire extinguisher label colour is blue. The fire extinguisher is use for organic materials such as paper and cardboard, fabrics and textiles, wood and coal. Plus, flammable liquids, like paint and petrol, flammable gases, like liquid petroleum gas (LPG) and acetylene and fires involving electrical equipment up to 1000v. 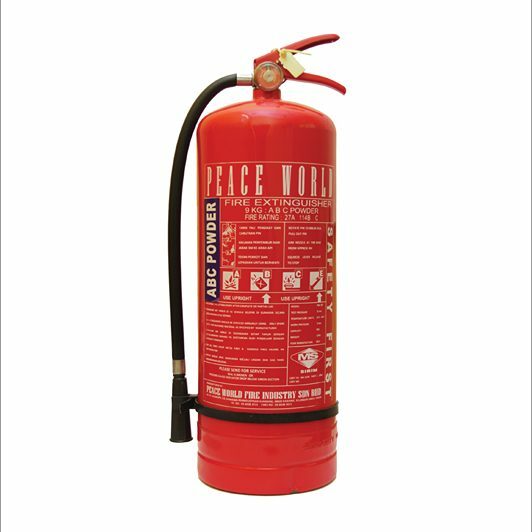 This type of fire extinguisher cannot use for fires involving cooking oil, fires involving electrical equipment over 1000v or in enclosed spaces, such as offices or residential properties. Dry powder fire extinguisher smothers fires by forming a barrier between the fuel and the source of oxygen. The dry powder fire extinguisher should be placed near to the source of the fire risk. What do the ABC ratings mean on Fire Extinguisher? “A” TRASH–WOOD–PAPER – Fire extinguisher with a Class A rating are effective against fires involving paper, wood, textiles, and plastics. “B” LIQUIDS – Fire extinguisher with a Class B rating are effective against flammable liquid fires. These can be fires where cooking liquids, oil, gasoline, kerosene, or paint have become ignited. “C” ELECTRICAL EQUIPMENT – Fire extinguisher with a Class C rating are suitable for fires in “live” electrical equipment. How to use fire extinguisher?